Jay and Jen purchased the property from Joyce, a kind 83-year old woman who, alongside her husband had lived on the property for the previous 45 years. In their younger years, they built many of the existing structures by hand – stone by stone, bit by bit, out of sheer love for the beautiful land they lived on. As they grew older, upkeep and care became overwhelming. Following the passing of her husband, Joyce made the difficult decision to sell their little piece of heaven in the mountains. But she had one condition – that it be sold to the right people. In June 2015, Jay and Jen were driving past the property and happened to notice a For Sale sign out front. The land was overgrown and as time had taken its toll, the buildings were outdated and in desperate need of attention. Having never shied away from a challenge, they approached Joyce about purchasing the property. She immediately burst into tears. These were the people she had been waiting for – the people she would entrust her beloved land to. The property officially changed hands in July 2015 and renovations began. Out of respect for the previous owners, Jay and Jen ensured that many of their personal, heartwarming details remained at The Landing for guests to appreciate. For example, the authentic stonework, hand-cut iron detailing on exposed beams, brass lion heads on doors, and the wooden trees that adorn the decks. Joyce’s hand-painted flowers on the pond gazebo still welcome guests out for a stroll. During renovations, Jay and Jen would come across small tokens — love notes and time capsules — placed in the walls by Joyce and her husband as they built the original structures so many years ago. These trinkets spoke of hope, faith, love, and teamwork – timeless sentiments that echo across the decades. Before sealing the walls back up during renovation, these love tokens were gently replaced — to forever honor the original builders. We welcome you to enjoy the brand new beauty that surrounds you at The Landing – the updates, amenities, and the fine details. But we also encourage you to sense and appreciate the enduring spirit of what has made this little piece of the Rocky Mountains so special for so long. 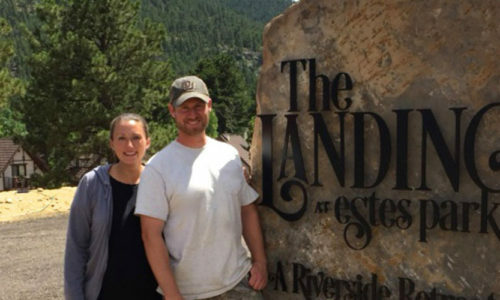 Welcome to The Landing at Estes Park.